A lot of children, maybe you included, were taught and are still told today to bathe daily. While some many believe cleanliness is next to godliness, the idea of bathing daily is outdated, unnecessary, and even unhealthy. While bathing may be a rather personal topic, it is something we need to each evaluate to be sure we are believing the truth, rather than a common myth. 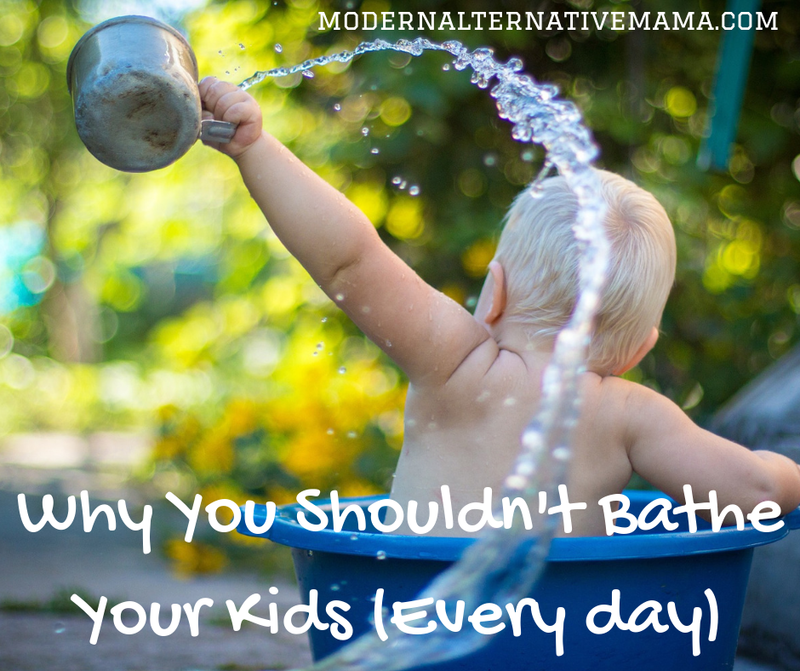 Even the American Academy of Pediatrics says children do not need to bathe daily. Let’s face it, not everyone loves showers and baths and wants to take one daily. And, that’s okay. For ages 6 to 11, most children need a bathe once or twice a week, according to the American Academy of Dermatology. They should also bathe after swimming in a natural body of water or a chlorinated pool, or if they become sweaty after exercising. And of course, if they have body odor, they should bathe. They then suggest that tweens and teenagers bathe and wash their face daily to help clear oil and acne, sweat, and body odor that hormones entail. However, not all teens will experience strong side effects to puberty as this, and this too may be overboard. Unless you’re a farmer or professional athlete, you likely don’t get dirty enough each day to really need to clean off. Your body actually has ways of cleaning itself. Your body needs those oils. Bathing daily washes off oils that your body produces, but your body needs these oils. You really don’t need lotion most of the time. The hot water of a shower or bath removes your natural oils that moisturize your skin. If you don’t bathe daily, your natural oils will stay on your skin and lotion won’t be as needed. Your body needs good bacteria too! In addition to your bodily oils, bathing also washes off bacteria that your body actually needs. Just like your gut, your skin has good bacteria on it that it needs to kill the bad bacteria, and stop chemicals and toxins from getting into and past your protective skin. This is part of the reason why antibacterial soaps are not a good idea. Daily bathing can be costly. Let’s face it, bathing daily can be costly, especially for a large family. Between the water and heat bills and hygiene product costs, spacing bathing out is also helpful financially to a family. According to the EPA, American families of four use on average 400 gallons of water per day. Cut your showers back and save the earth some water, and the city some fluoride. When you do bathe, be aware of the many chemicals and toxins in hygiene products. Antibacterial soaps and oil-stripping shampoos are just the beginning of the hygiene product toxin issues. Really, you can cover all your hygiene bases with a quality oil, like almond or coconut, a mild all-purpose soap, like Dr. Bronner’s or a small business soap maker, and maybe some essential oils. Watch out for these harsh chemicals hiding in your hygiene products. Sodium Laurel Sulfate (SLS) is found in many products and is known for neurotoxicity, organ toxicity, and carcinogenic properties. Triclosan. This is an antimicrobial pesticide found in soaps and toothpastes. No thanks. Parabens. Parabens have a close link to breast cancer, and likely other cancers. Here is a list of parabens. Phthalates. Another cancer heavy hitter that also is known for reproductive and endocrine disruption. Butylated Hydroxyanisole (BHA). This is a carcinogen and can damage the reproductive system. It’s also a great idea to get a shower or bath water filter, or even a whole house system. That way, when you do bathe, you know you’re not taking in any toxins and are really getting clean. If you’re worried about your bedtime routine, replace the shower or bath with some bedtime essential oils, calming music, and reading. The need to bathe daily is an old wive’s tale for modern moms. It is entirely not necessary, and can even harmful. Do yourself, and your water bill, a favor and switch to one or twice a week bathing. How often do your kids bathe?